Are you ready for some baseball? Opening Day is almost here and so to get myself ready for peanut-and-cracker-jack season, I decided to read Wherever I Wind Up – by reigning Cy Young Award winner R.A. Dickey. I’ve been a fan of his since watching him pitch briefly with the Minnesota Twins. Then I became an even bigger fan when I researched part of his story for the blog post I wrote about his faith in 2011. 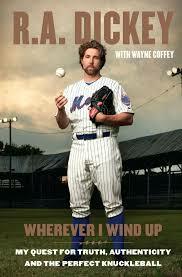 But after seeing his career take off with the Mets, and then the excitement in Canada about Dickey joining the Toronto Blue Jays, I decided I wanted to check out the book he’s written about his story and his journeys of faith and baseball. It is an absorbing book. 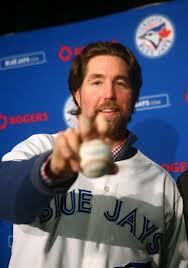 Dickey grew up dealing with abuse, alcoholism and divorce. These would all have a deep impact on his childhood and carry over into his adult life. It talks about the promise that his baseball career had coming out of college, and how it appeared to be over when it was discovered that he was missing a ligament in his elbow – it just wasn’t there. Doctors were amazed that he could even turn a doorknob, let alone throw a 90+MPH fastball. The Texas Rangers withdrew their contract offer and offered significantly less. For the next 15 years, Dickey would battle his way around the minor leagues, trying to redefine himself by throwing a pitch that few can ever throw masterfully enough to make it to the Major Leagues – the Knuckleball. You can hear him tell his story to ESPN’s Jeremy Schaap at this link. 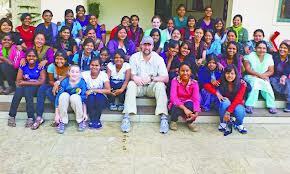 There you can also read about a recent trip he took with his daughters to India. The purpose of the trip? To become more aware and deliberate in attempting to stop human trafficking. 1- God will get us to a place where we understand we need Him. He talks about a life changing experience he had while trying to swim across the Missouri River. He is seeking to gain validation for his career and demonstrate control of his life. But it almost kills him. He nearly drowns in the river. The lesson that he shares is as he is sinking, surrendering control and allowing himself to be taken by the currents. We are reminded that we are not in control. God is working things out. Even when we feel like taking control, He is ultimately the one that guides us. He will not necessarily guide us out of the trouble our choices take us to, but He will give us a chance to learn from our mistakes. God puts so many people in our lives that influence us. Our faith journey bears some pieces that we learn from mentors along the way. I know that I have learned many lessons in my life from people that were there for a season and have moved on, and some that are there daily. Our goal is to reflect Christ in our lives, and God has put lots of Christ-like examples around us that we can learn from. We become a part of their legacy, and will have opportunities to influence others with what we have learned, too. We simply need to stay tuned into the Holy Spirit and share what they need us to share. There is so much more to share from this book – far beyond what I can cover in a blogpost. I would advise any fan of baseball, sports, christian athletes and people figuring out how to live for Jesus read this book. God is good and can use hard, challenging and downright awful experiences to shape us and draw us closer to Him. And in the end, God is glorified in a life changed for the better by being lived for Him!